The oceans make up 70% of the surface area of our planet and support a wide array of life on our planet. The beauty and splendor of this life has drawn the adventures of the world to seek the areas of greatest beauty. One type of this beauty is known around the world as corral reefs, the most famous of these is the Great Barrier Reef of Australia. The dangers and damage of human impact has often been a topic of great discussion for many, especially for those in Australia that have watched these changes over their lifetime. However, not all our corral reefs get such attention. One example is the Midway Atoll, a circular corral reef that circles Midway Island. After the end of WWII, where Midway Island was the scene of a week long battle to secure this ‘Midway point’ between Hawaii and Japan, the area was turned into a natural wildlife preserve. For the Albatross that call this island home, the assurances that man would not be a regular interference must have been a nice change. According to a recent NPR Article, Albatross are one of the most faithful animals on Earth, taking up to 15 years to decide on a mate and stay mated for life. According to the same article, these birds also raise young for many years, one of note was raising young at 62 years old! While this is an amazing statistic, there are some scary things to be concerned about when we examine what this far away location look like up close. From afar, the Midway atoll can generate images of beauty and relaxation, the idea of clear waters and sandy beaches could generate images of rest and relation for many. Unfortunately, things aren’t as beautiful up close as one would prefer – the culprit is of course man made materials that have been carelessly discarded to have a second life as the materials of death for many forms of life. These materials are of course – PLASTICS. Plastics, first created in the 1850’s, quickly became a manufactured good that when discarded; entered the waste stream with little concern or flair. These materials entered, as did much poorly managed waste over the last 150 years, landfills and garbage barges. These landfill barges, like the ones discussed in this previous blog, took garbage out to sea, sometimes as close as 3 miles out to sea. What happened next is that these wastes began to travel the world’s oceanic currents. These gyres, mechanically broke down many of the materials, especially those that were of organic material like food wastes and paper. Unfortunately, many of the items could not break down in the currents. These materials travel the currents and travel around the globe. Some of the plastics break down by photo degradion, the sun and salt water breaking down the chemical bonds. At the same time these plastics return the favor, releasing chemicals like formaldehyde, asbestos, BPA and DDT into the water. Additionally, the plastics don’t really go away, they just break down into smaller pieces of themselves much in the way rocks break into particles of sand. The plastics that don’t break down, they float around the world until landing on a beach somewhere. This is the case for the Midway Atoll. Images like the one above, are often far from the mind of the common consumer as we purchase an ice cold bottle of soda on a sweltering day, leaving the lid of the bottle where it lands in the parking lot. What we don’t realize is that the sudden rains that come in overnight pick up that bottle cap and deposit it into the storm-water system where it’s carried directly to an outbound water system. Eventually, it is likely that this plastic will find it’s way into a major river system where it will then travel into the ocean. The problem is so common that earlier this month an article was written about a theoretical boat being designed by the Dyson family, that would vacuum plastic and other pollutants out of river waters before they enter the ocean. Why would someone want to clean the rivers of plastic? It is estimated that tens of thousands of pieces of plastic enter our oceans as former land based pieces of pollution or consumer goods on a daily basis. We know that these estimates are true by viewing studies of both the gyres themselves, and looking at pictures like those here. Each of these pieces of plastic, containing unknown internal contaminants is bringing its own forms of destruction on the planet. In far away places like the Midway Atoll, these plastics bring real damage. 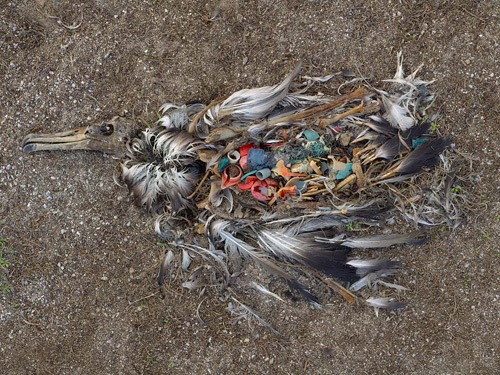 The National Oceanic and Atmospheric Association (NOAA) have found that of 1/2 million albatross born in the Atoll- 200,000 die annually due to plastic consumption. Adult birds may know how to stay in a committed relationship, but the introduction of plastics into the environment did not come with a clear cut instructions not to eat. What happens is that from the point of hatching, plastic enters the food stream. All to often this means full bellies with no room for healthy nutrients to develop strong bodies and bones structures. Photographs like this one from Chris Jordan bring the starteling truth to light. Unfortunately, the Midway Atoll has been littered wiht such carcases for over a decade. On a recent study of Freshwater Seafarers off the mainland near Tazmania, Australia – Dr. Jennifer Lavers discovered that 16% of hatchlings were fed plastic. She also hypothesis that these plastics are poisoning the birds with heavy metals and other contaminates. She also highlights in this blog how she pulls over 400 pieces of plastic out of one Albatross on Midway. Because these areas of contamination are far from human existence, they are often forgotten about. Fortunately, there are those who are interested in keeping this, and many other formerly pristine areas of the planet in the best condition possible. 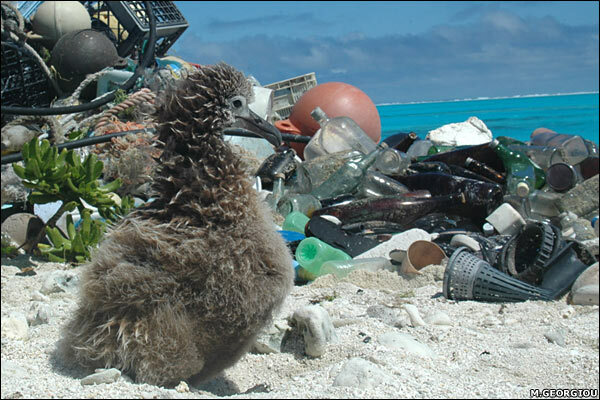 Once such crew pulled over 14 tons of plastic from the Midway Atoll in 2013. 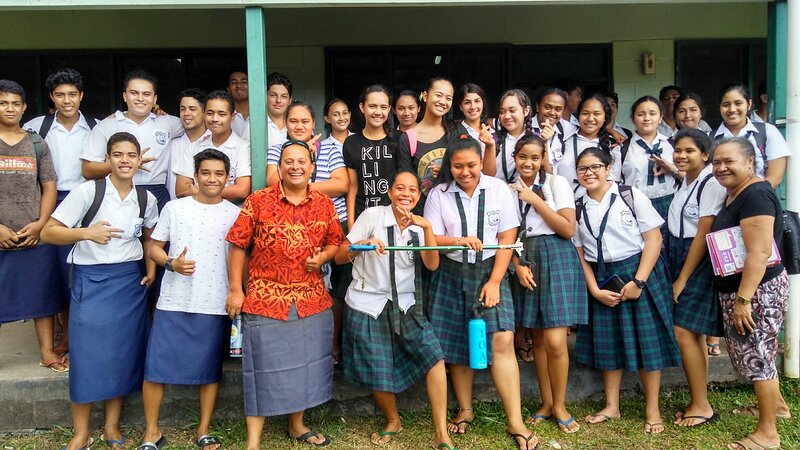 You can read more about their efforts here. Upon seeing this much plastic pollution, maybe you will consider making significant changes in your consumption patterns today. While the average reader will not believe it to be the case, just one refillable water bottle can reduce plastic and oil consumption by as much as one barrell per year! Other things that you can do to help eliminate this pollution is to learn about your communities recycling regulatons and become an effective recycler of post consumed items and always, always carry a bag with you so you can say no to a plastc one, each and everytime you go shopping!